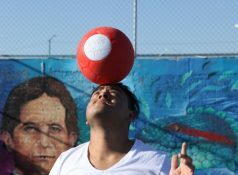 The One World Futbol never needs a pump and never goes flat. We've reached more than 60 million youth through the power of play. Buy 10+ balls by using our special rate for the cause of your choice. Partnerships can empower brands to do good through customized solutions. We are a social impact company whose products can withstand the toughest playing conditions in the world yet are still ideal for the beach, park, street or your local soccer field. Join us in creating a world where people thrive through play.